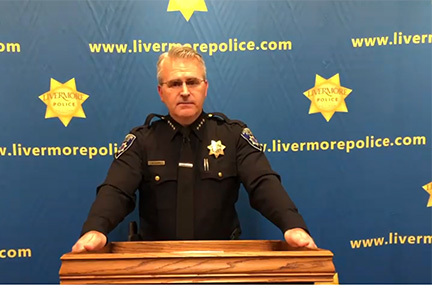 On Friday, Livermore Police Chief Michael Harris issued a statement to the community after an incident involving one of their officers. According to Chief Harris, an officer is alleged as to having inappropriate sexual conduct with a woman he had met after responding to a call at her home in October. Once the accusations were made, the officer was placed on administrative leave before he resigned. The results of the criminal investigation have been handed over to office of the Alameda County District Attorney, which will make a decision on whether charges should be brought against the former officer. In October, our department received a report from a woman who alleged an on-duty Livermore police officer engaged in inappropriate sexual conduct with her. As soon as we received the report, we immediately launched both a criminal and internal investigation and the officer was placed on administrative leave. The officer involved has since resigned his position with the police department. The conduct described in the allegations would be a very serious violation of the trust our community places in its police officers and our department. The woman reports she met the officer when he responded to her home on a health-related call in June of this year. Following that first meeting, she maintains the officer befriended her and over time persuaded her to engage in a series of sexual encounters. The results of the criminal investigation have been handed over to office of the Alameda County District Attorney, which will make a decision on whether charges should be brought against the former officer. The internal investigation continues even though the officer has resigned. We are not releasing the identity of the victim in order to protect her privacy. I do not have to wait for the results of an investigation to make this very clear — any report of inappropriate conduct on the part of a police officer is something I take extremely seriously. We simply cannot tolerate any conduct that diminishes the trust our community places in us. The men and women of the Livermore Police Department work hard every day to earn the trust of our residents, and we intend to guard that trust vigilantly. I know the men and women of the Livermore Police Department are as concerned and disappointed by this as I am. I know this does not reflect who they are and how they do their jobs. I owe it to these excellent officers and to you, the community, to take this matter very seriously, to learn all we can from it, and to ensure it never happens again. In the US in over 30 states, uniformed police officers can engage in sexual acts ON THE JOB, as long as they prove the other party consented. When your profession is built on “your word versus theirs”, impunity and acts like this can run continue. He resigned before he was fired. He knew better. He didn’t care.